Please fill out this online form if you wish to participate in the 2019 Commencement Ceremony. The reservation deadline is March 16, 2019. The participation in the Commencement ceremony does not guarantee graduation. Graduation is solely dependent upon the satisfactory completion of all academic requirements of the University. Since our first Commencement ceremony in 1914, thousands of graduates, along with their families and friends, have gathered on the Minot State University campus to celebrate the achievements of our academic community. As we welcome you and your guests this year, please use this website guide to help plan your graduation day to ensure that it will be a positive experience. Minot State University's Commencement exercises for Master's, Bachelor's, and Associate's degree candidates will be held at 10:00 am, Friday, May 10, 2019, in the Minot State University Dome. We expect to host more than 3,500 guests on campus throughout the day, so please expect to arrive early to prepare for a memorable day. Order your cap and gown (required), class ring and graduation announcements (optional) from the Herff Jones website. For more information click Purchase Regalia or call the Bookstore with any questions at 701-858-3390. The Dome will be open to the public as early as 8:30 am on Commencement day. There will be unlimited parking available for family and friends on the north side of the Dome, with handicap parking on the southeast side. Elevator access is available in the north entrance of the Dome. An interpreter will also be on hand on graduation day to sign the graduation ceremony to accommodate individuals with hearing impairments. Arrangements can be made for persons with disabilities that need seating accommodations. Please contact the Registrar's Office prior to April 30, 2019, for assistance at 701-858-3345 or 1-800-777-0750 ext. 3345. Candidates for graduation are asked to dress professionally on Commencement day. Only pre-approved organizational garments may be worn in addition to the cap and gown. As early as April 21, tentative seating assignments will be emailed to the candidates. The seating chart will be in the order of Minot State University faculty, Graduate School, Honors Program, College of Arts & Sciences, College of Business, College of Education and Health Services, and Dakota College at Bottineau. View the seating chart and MSU Dome layout. Candidates with double majors from two different colleges will be placed within the college of the first major listed on the graduation application unless written notification to the Registrar's Office is received by March 22, 2019. A final seating chart will be posted at both entrances of the Dome the morning of the ceremony. Students will line up along the second floor east and west halls according to the seating chart instructions. MSU staff and faculty will be on hand to assist the candidates. Facebook: Be sure to "like" Minot State University to receive updates. You can post directly to our timeline and/or post to your own. We will have a commencement day photo album on Facebook late Friday afternoon. Twitter: Minot State University's Twitter handle is @MinotStateU. Don't miss a Tweet! 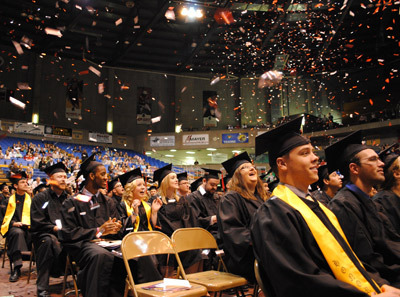 Students are to report to the second level of the Minot State University Dome Friday, May 10, by 9:00 am dressed in their graduation regalia to line up. The line up will be in the order of Minot State University faculty, Graduate School, Honors Program, College of Arts & Sciences, College of Business, College of Education and Health Services, and Dakota College at Bottineau. Names cards will be distributed, with corresponding seat numbers, to all other candidates in the row prior to the processional. Individuals concerned about the mispronunciation of their names should provide a phonetic pronunciation below the name on the card. Promptly at 10:00 am, the faculty will lead all the candidates down the stairs to the Dome floor. Row numbers will be posted on the floor at the entrance of each row. Everyone is to remain standing until the invocation is complete. Men are to temporarily remove their mortarboards during the invocation. NO ITEMS such as cameras, purses, bags, backpacks, pop, candy, etc. are allowed to be carried by the candidates. Such items will be removed by MSU staff upon entering the Dome floor. These items may be picked up after the ceremony near the stage area. When each college is called, the respective candidates will stand as a group. Then, one row at a time, graduates will be lead by a banner carrier to the west (left) ramp. Each candidate will present his/her name card to the faculty marshal at the podium. As each name and honor (if received) is read, the graduates will cross the stage to meet the dean of their respective college to receive their congratulatory scroll and shake hands with the President. Each candidate exits down the east (right) ramp and returns to his/her assigned seat. The first master's graduate will be symbolically hood. All other graduate students will have received their hoods prior to entering the Dome. Associate's Degree candidates' tassels will remain on the right side of their mortarboards throughout the ceremony. Bachelor's Degree candidates will wear their tassels on the right side of the mortarboards until the President confers the degree onto all students. At this time, tassels are moved to the left side. Master's Degree candidates' tassels will remain on the left side of their mortar boards throughout the ceremony. All newly conferred degree holders will rise from their seats when the faculty stands in the front rows. Graduates will leave the Dome floor in the same manner as they entered. *Please arrange to meet family and friends away from the entrance of the Dome, and please vacate the front lobby area immediately so that the exits are not blocked. A professional photographer will photograph each graduate as he/she receives his/her diploma. Proofs will be mailed out at a later date by the photographer. Graduates will have the opportunity to purchase these photos, but there is no obligation to do so. Guests are welcome to take photos during the ceremony, but they are asked to be considerate of others present and remain well away from the entrance or exit ramp. Guests are asked to remain in their seats until the processional, ceremony, and recessional are completed. Cake and punch will be served to all graduates and their families outside in the front atrium in front of the Dome. An unofficial transcript will be sent upon completion and review of all degree requirements followed by diplomas 4-6 weeks later. Please be sure the Registrar's Office is notified of address changes. Only the degree earned will be printed on the diploma. This means no major, minor, or concentration information will show on the printed diploma. Official transcripts may be ordered through the Registrar's Office at a fee of $8.00 per copy, unless special ordering options are chosen. Additional ordering information can be found on the transcripts page of the Registrar's website. The Minot State University Bookstore offers a variety of diploma frames the graduates may purchase. Graduates may purchase diploma frames at the Bookstore, at the Commencement ceremony, order them online on the Bookstore website, or for a small fee, have the frames mailed directly to them. For more information please contact the Bookstore at 701-858-3390 or 1-800-777-0750 ext. 3390. A safe Commencement celebration for the graduates and their families is Minot State University's first priority. Alcoholic beverages are not permitted on the campus. MSU also adheres to a no-smoking policy on campus. Smoking is not allowed in the buildings or on the campus of the University.